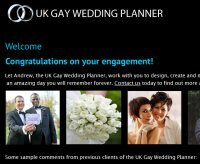 Gay Wedding Planner - For gay weddings with the gosh factor. Let Andrew, the UK Gay Wedding Planner, work with you to design, create and manage your perfect wedding or civil partnership - an amazing day you will remember forever. Contact us today to find out more about the packages we offer.